Send the classic wine gift. Classic Wine & Gourmet Basket. This elegant basket of gourmet treats is a great alternative for your gift-giving needs. Select one or two bottles of wine. Your choice of one champagne, a red & white wine, or two bottles of each to add to the basket. To really make a lasting impression, choose the bottle of fine Champagne! The gourmet collection may include crackers, sausage, gourmet cheese, and candies. 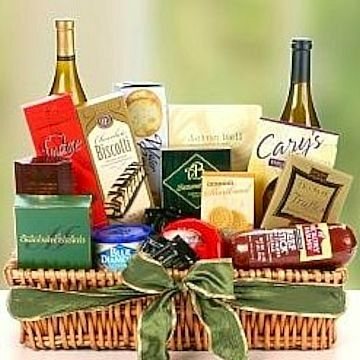 Exact basket and gourmet selection may vary by season and delivery location.